As the new Brandywine Living at Mahwah nears completion, the future residents at Mahwah are getting a head start on Escapades for Life! 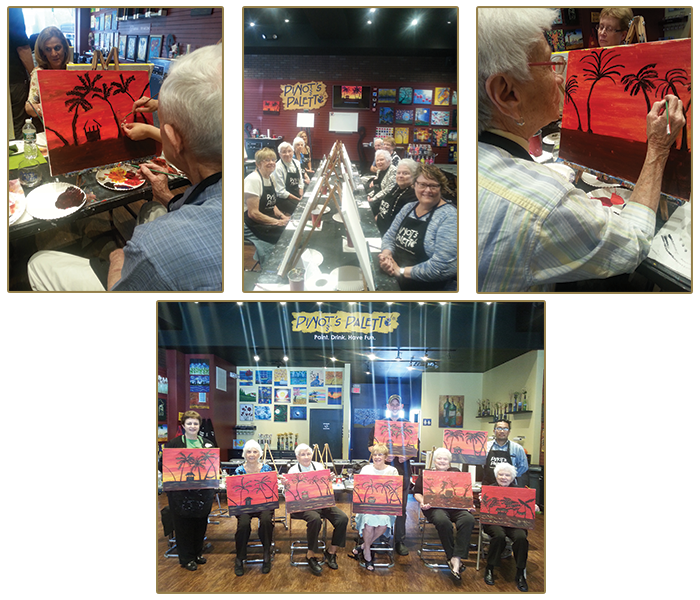 This week they participated in a Pinot’s Palette paint event. The entire Mahwah team came together getting everyone involved and providing our future residents and families a glimpse of the phenomenal food and activities that await them when our Mahwah community opens! We also found out that Roland, the Environmental Services Director, can paint very well! The residents and their families are so excited to move in – they have loved all of the events prior to the opening and are looking forward to VIP tours in the upcoming weeks. Everyone is raving about their experience with Brandywine Senior Living throughout this process, and in turn, we can’t wait to provide our new residents and their families with the entire Brandywine experience!